I can be sooo technologically inept at times … like with this Blog. If you’ve made a comment on any of the entries, they were inadvertently deleted — sight unseen. WordPress utilizes a spam catcher (I got that part). What I didn’t realize was that when I told it to “delete all spam comments,” it was also deleting pending comments that were in another part of the admin area. An area I didn’t find until this morning. After I’d deleted everything. Or perhaps it was all spam (no, I don’t need any life insurance, thank you) and I’m merely babbling into cyberspace about the unique creatures that share our life/home and our rescue efforts. ::::::pressing nose against screen and tapping monitor:::::: Hellooooo, anybody out there?! To make this dog/rescue related: We’re dogsitting a former foster through the end of June. A foster that most likely would have become a permanent fixture had a certain puppy not arrived on the scene (and hubby throwing a royal hissy fit about “having too many dogs”). In any event, Dinky comes back to visit every now and again when his owners are on an extended vacation. Yup, that’s our Dinky, suckin’ up big time! 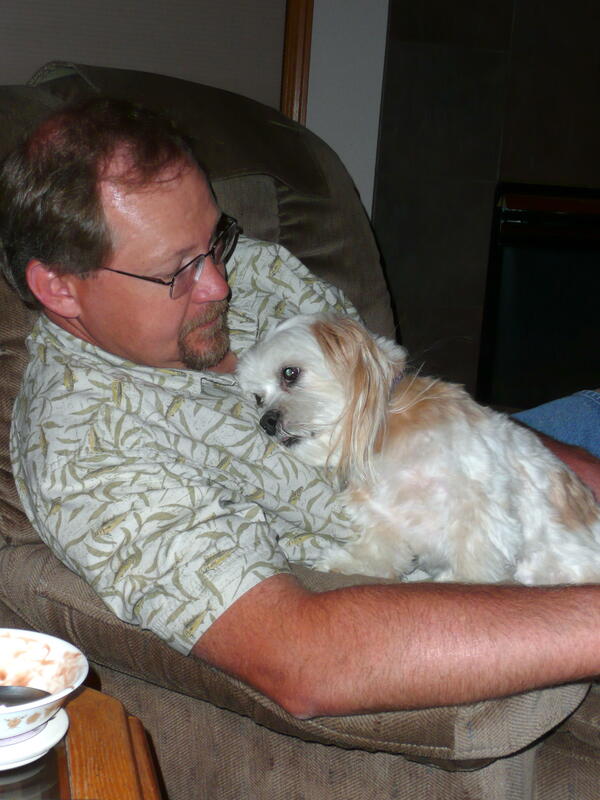 Not sure who is enjoying the one-on-one time more … hubby or Dinky. Too cute! Can he come to visit us too?!? While I’m sure Senghe would have loved to meet Dinky today, Dinks had to stay home with the rest of the crew. We had a fabulous turnout for Reunion/Expo and couldn’t have asked for a better park. Nice shady neighborhood park … photos to follow!